Lamebook – Funny Facebook Statuses, Fails, LOLs and More – The Original » A Smart Start! 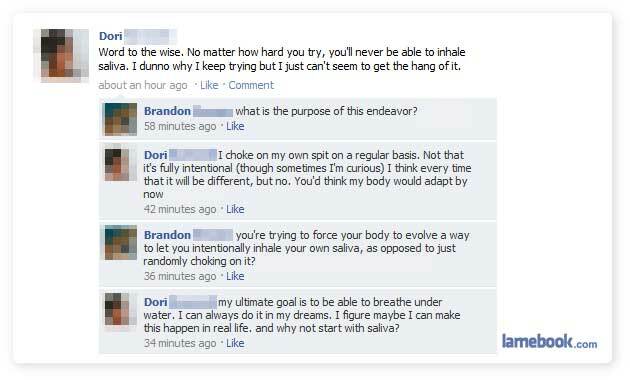 Dori is clearly a genius. When Global warming kill us she’ll be fine because she can inhale her own spit. Dana is proof that it is possible for evolution to go backwards. Oh my gosh it’s contagious! How do these stupid people survive? Luck? Dana is proof that it is possible for evolution can go backwards? @rachhh Yeah i think it’s DEVOLUTION is a not so layman’s term. Sure Dana it will get dryder fastester if you setted it real high-like an maybe put you’re hole head in there two. Try it. Please. What can I say? I told you it was contagious. Dana yer micrewave will dryder hair bestest when you wear a metal hairband. Also put a piller in there to rest yer head on so the turntable wont make you dizzy. Why don’t you give it a go, Dana? You’ve got nothing to lose. Wait. How would that work? Microwaves only function with the door closed. So… is she wearing a wig, or does she have a giant “walk-in” microwave? Actually buckle_up some of the old microwaves used to break and the sensors would fail alowing you to turn a microwave on with the door open. Not that I am defending this moron, just a memory that pop’d into my head. He probably cut his thumb almost off opening a box of vitamins with a box cutter. Never happened to me, but seen plenty of guys have it happen at the different places I have worked.